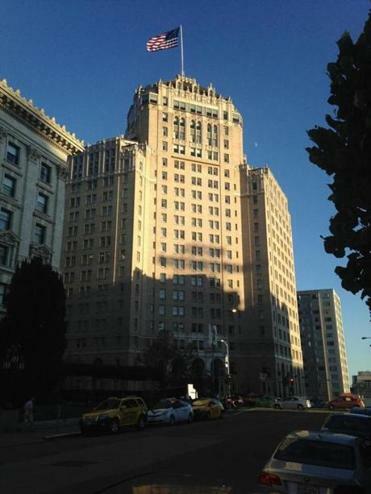 The Intercontinental Mark Hopkins San Francisco has a history special to World War II vets. SAN FRANCISCO — When I moved to San Francisco in 2013, my grandfather, a World War II veteran, suggested I check out a place here that held special memories for him: the Top of the Mark. He remembered the bar vividly and for good reason. There, he downed the drink he thought might be his last. During the war, San Francisco — the largest port on the West Coast — served as the gateway to and from the Pacific Theater. Hundreds of thousands of servicemen passed through the city and through a watering hole on the 19th floor of the famous and extravagant Mark Hopkins Hotel. With picturesque views from atop Nob Hill, Top of the Mark became a touchstone for US troops heading to or returning from the war in the Pacific. While the number of World War II veterans has dwindled, the Top of the Mark remains a meaningful, reflective stopping point for them.. This summer marked the 70th anniversary of the Allied victories in Europe and Japan. T. J. Chapman, 19 and a Navy ensign, was a part of the latter group. Soldiers bought specially designated bottles that were served only to their squadron. The serviceman who consumed the last of it bought the refill for the squadron. The bar became so iconic that many servicemen named their tents and Quonset huts after it, according to Time. Even the wives and girlfriends of the soldiers staked out their claims to the bar. One tradition, according to the hotel (now the InterContinental Mark Hopkins San Francisco), was for the servicemen’s significant others to watch the Navy ships leave San Francisco Bay for the Pacific Theater. The northwest corner of the Top of the Mark became known as “Weepers’ Corner” because wives and girlfriends gathered there for a last glimpse of their loved ones’ ships as they slipped over the horizon. In 2015, the spectacular view looks much the way it did in 1945. The sights and sounds of San Francisco remain: the light blue Ferry Building, the cable cars that climb California Street, and the orange Golden Gate Bridge, of course, silhouetted by sunsets over the water. It’s easy to see why Top of the Mark became a place for soldiers to contemplate life, death, and war. Weighing heavily was the fierce fighting they were bound for, against a hell-bent enemy. If it were going to be your last drink, you at least had a hell of a view for it. And if it were your first drink after surviving the battles overseas, you couldn’t find a better view to toast. Some things about the view have changed. The massive artillery guns surrounding the West Coast’s most important harbor — some capable of firing 25 miles out into the ocean — have been dismantled or designated historic sites. Cruisers that docked along the Embarcadero have been replaced with ferries, which shuttle commuters around the bay, to and from places such as the quaint seaside communities of Tiburon and Sausalito. To the East, sparkling high rises and cranes building new ones — the product of the technology boom — litter the Financial District’s skyline. Ships heading west and crossing the horizon are no longer battleships, but industrial barges on the trade routes to Asia. Today, the Top of the Mark serves businesspeople in suits and pencil skirts, many in town for conferences and staying at the hotel. The decor is wooden and stately, but has an airy feel thanks to the floor-to-ceiling and 360-degree windows. The lounge’s history with the military is still prominent. In the lobby hangs a framed Life magazine article from the bar’s heyday during World War II. Tucked in one corner of the bar lobby is a glass cabinet full of the squadron bottles, where soldiers can still take a drink from their designated handle. Also in the locked cabinet are logbooks filled with memories and photographs from veterans and their relatives. Sebastian Sagasti, who works at the bar, says they still serve many veterans of all ages — many who are dressed in full uniform and come to reminisce. “They all have fascinating, fascinating stories,” he says. Children of deceased veterans often visit for the first time, having heard their fathers talk about the bar. Keith Chapman can be reached at keith.w.chapman@gmail.com.